Monster.com is a fat target. It has a market cap of nearly $7 billion and generates over $1 billion per year in revenue. All that revenue is largely generated on paid job listings, starting off at $475 for a single listing. Hotjobs and a bunch of other services provide similar services, all for a fee. Even Craigslist charges for job listings in many markets. Seattle-based Jobster, which has raised nearly $50 million in venture capital, previously had a similar model – charging employers a lot of money to help them find qualified candidates. But late last year they made a decision to try something different. They went through a round of layoffs earlier this year and are making a dramatic business model shift starting tonight, by making all job listings free (and much more). Their goal is to do what PlentyOfFish is doing to Match.com. PlentyOfFish is a dating site very much like Match, but doesn’t charge its users to hook them up. The company is doing quite well based solely on advertising revenue, and has been a serious thorn in the side of the for-pay dating sites. By reducing the cost of a job listing to zero, Jobster hopes to make a large dent in Monster’s billion dollar a year revenue stream. 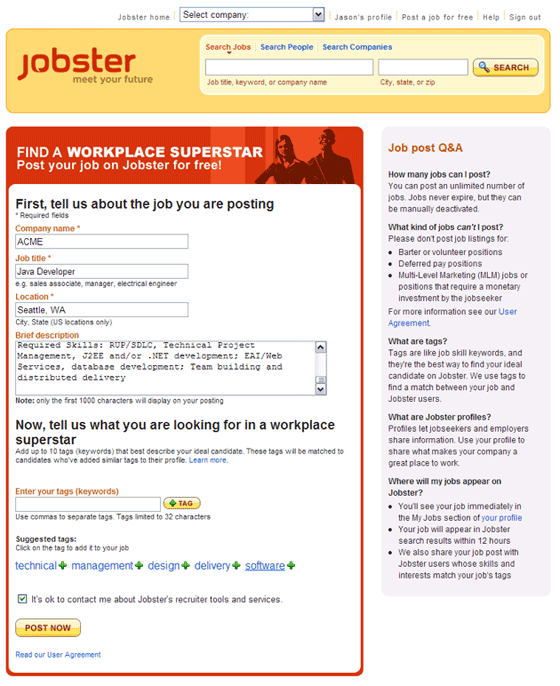 Jobster is also a social network, and is more like Facebook or LinkedIn than Monster.com or other job sites. Like LinkedIn, it’s a place people can keep their resume up to date at all times, even when they aren’t looking for a job. Users also tag themselves (your top five tags are called “supertags”), and Jobster will notify you of jobs that may fit your profile. See CEO Jason Goldberg’s profile page for an example. All of this tag-based matching comes from Jobby, a company Jobster acquired last year. Tags also help users match with other users, and additional information. Employers can start listing jobs immediately and for free. The form (see image below) has just five fields (Company, Title, Location, Description, Tags). The employer will immediately be alerted to potential candidates based on the tags, and candidates will also see the opportunity appear within their profile. Jobster is also syndicating these listings out via RSS and other methods, so job search engines like Simply Hired and Indeed will be able to add these to other listings from around the web. Edgeio (a company I co-founded) will be one of the first partners to integrate Jobster data into their listings. Given that Jobster already has a large footprint in the job listing space, this is more than an experiment. It’s a full frontal assault on Monster’s business model. This can also hit LinkedIn indirectly if people start focusing on Jobster as a more interesting place to keep their resumes and contacts. Monster will probably be keeping an alert eye on how Jobster is doing, and this may also force them to update their aging platform and pricing models to more modern standards. For employers and job seekers, this is nothing but good news. In the same press release announcing the new product, Jobster also confirms the rumor that they have become Facebook’s exclusive partner for job listings (beating out Monster.com and others). The new functionality will be available this Spring.